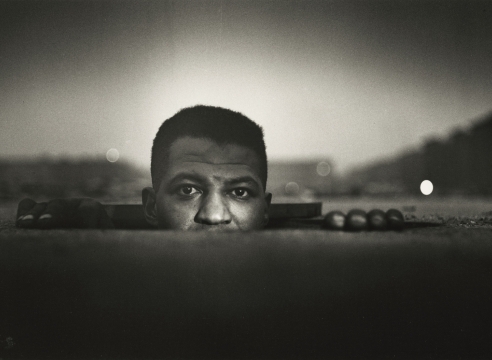 Gordon Parks: Centennial will survey nearly 40 works spanning five decades of the artist’s career beginning in the early 1940s, including some of the legendary photographer’s most seminal images. Among the highlights in Gordon Parks: Centennial will be American Gothic, 1942. Considered to be Parks’s signature image, the gelatin silver print depicts Ella Watson, a black woman who mopped floors at a government building. Astonished by the prejudice he encountered on his first day in Washington D.C., Parks struck up a conversation with Watson and heard about the difficulties she faced due to bigotry and discrimination. That day Parks himself had been refused service at a clothing store, restaurant, and movie theater. Watson agreed to be photographed by him, holding a broom behind an American flag. Park’s riff on the iconic 1930 painting of the same name by Grant Wood became the symbol of the burgeoning civil rights movement.